The Itty Bitty Kitty Committee: In All This Excitement, I Almost Forgot! In All This Excitement, I Almost Forgot! We've got another auction up! Jump in and place your bid!! The winner gets to name this handsome little fellow. Click HERE to visit the auction, and get in on the action! This is your last chance! All other naming rights auctions have ended!! OH, and while you're there, be sure to check out all the art! Poor little buddy! he looks as if his feelings are hurt because he was afraid he'd been forgotten. Not so, little chum! We love you! 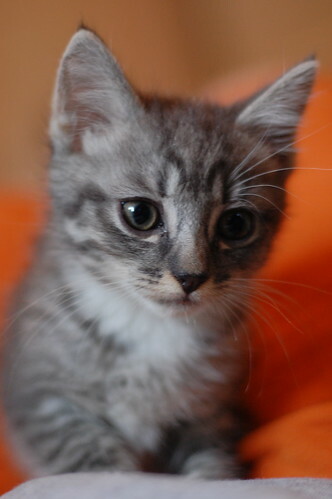 I have to admit gray tabbies just steal my heart like no others. I don't think he's a sad sack -- just pensive on what his name will be -- hope it will be a good one !